The University of Chicago recently sent a letter to incoming students which has made me – for the first time – embarrassed to be affiliated with my undergraduate institution. This letter (as Kevin Gannon has noted) seems to be equal parts pedagogical statement and public posture. It certainly needs to be understood in terms of evolving debates about college campuses, academic politics and student life. I, however, want to address it from the perspective of both an alumna of the college and as a professor. The call for “civility and mutual respect” in this letter is a heartening one, as is the reminder that “freedom of expression does not mean the freedom to harass or threaten others.” (This, by the way, sounds like what most academics mean when they talk about safe spaces) A space in which “members of our community [are expected] to be engaged in rigorous debate, discussion and even disagreement” and to constructively manage ideas that “may challenge you and even cause discomfort” resonates with what I expected when I first stepped into U(C) classrooms some many years ago. In my experience, and as described by faculty from different institutions, trigger warnings are not about “cancel[ing] speakers because their topics might prove controversial.” Neither are they intended to allow students to “retreat form ideas and perspectives at odds with their own.” In the practice I have seen, trigger warnings are a way for faculty to help students manage their reactions to material without disrupting the intellectual community of the class, and without derailing students’ own academic progress. For example, I teach on the history of disaster. We read about terrible, heartbreaking things. It does no one in my class – neither me nor the students – any good to not anticipate the possibility that some students might react strongly to (for example) discussions of the death of orphan children during the Galveston Hurricane. Flagging scenes of infanticide (a trigger warning) in our readings likewise has no cost – it simply alerts students who may have strong reactions to a particular topic that they might want to take extra steps to prepare for class that day. * These might include drafting a discussion question in advance, finding a time to do reading that might be trauma-inducing when they will not be in public, or even simply practicing scripts to get through the class period. Rather than undercutting intellectual discourse or protecting students from uncomfortable material, trigger warnings as practiced by me and by many faculty seek to ensure that a student can fully prepare – in what ever way they need – t participate in class. Dean Ellison similarly seems to be mistaken about the common use and history of “safe space.” While it is laudable that the U(C) “welcomes people of all backgrounds” and encourages “diversity of opinion and background,” American higher education is historically constructed, and has – historically – been friendlier and more accommodating to certain groups more than others. For one excellent example of this history, see Craig Steven Wilder’s Ebony and Ivy detailing the racial history of American education (while I have the utmost respect for Dean Boyer – the dean of the college when I was an undergrad – I can’t help but think that Wilder’s would certainly be a book that incoming first years would benefit from reading). This history means that, in practice, colleges and university have been – and continue to be – safer spaces for some students than for others. Those for whom the college is already safe – many of them students who are not otherwise marginalized – do not need to petition for safe spaces on campus. For them it already is one. To reject the idea of safe spaces or to pre-empt any protest in response to a scheduled U(C) speaker is to say – again in practice – that the University of Chicago has no interest in attending to the needs of students who do not already feel safe. These might include (and this is based on my experiences both as a student and now as a faculty member) students of color, first generation college students, LGBTQA students, undocumented students, students who grew up in poverty, students with learning differences, students with illnesses, students with disabilities. Making higher education more welcoming to these students sometimes means re-imagining what campus civility looks like. It means, rather than telling students that protests are unwelcome and silencing, interrogating why those students thought that protest was the best way to speak to the administration. It involves treating protest as a tool of debate rather than as a fait accompli**. It involves listening to students who ask for a heads up about potentially traumatic material. None of this silences academic discourse. Rather, it makes academic discourse a space in which more and more diverse students can participate. As practiced*** most frequently, trigger warnings allow for classes to be flexible enough to accommodate students whose experiences of trauma and crisis are different from our (the faculty’s) own. Discussions of how to make more safe spaces on campus are a way to expand campus culture to include people who historically were excluded from it. Neither of these models is detrimental to undergraduate education. Neither undermines the life of the mind. It shocks and saddens me that a place which prides itself on intellectual rigor for all students would take such a stance. *They might also choose to skip class, but I have seen no evidence that talking about possibly traumatizing material makes a student any more likely to skip a class than any other of the usual reasons college students have. Incidentally, this is why I do not have an excused absence policy in my classes – students can choose to be absent from a fixed number of class meetings without penalty, and I am not put in a position of adjudicating a good reason for missing my class. **I want to think about this a bit more about this, but discussions of student protests of speakers tend to assume that having a protest means that the speaker will not come. This has not been my experience of student protests, and is a perspective which, I think, dangerously misrepresents the institutional power that students, faculty and university deans have respectively. When we talk about student protests, I think we miss the ways in which institutions and (in the case of Rice, invited speakers) have the power to react to protest. Many times, institutions and speakers decide that a talk will go on. When I was a U(C) undergrad, Fareed Zakaria came to speak. Some students walked out in the middle of the talk. Some called for the talk to be cancelled. Both of these actions prompted robust and sustained discussion, and allowed for discussion about the place that Zakaria’s ideas had on the U(C) campus. Calling for the cancellation of the talk was part of that discussion, not an attempt to silence it. *** I have a shirt from my time as an undergraduate which reads “that’s all very well in practice, but how does it work in theory.” I still love that shirt, but I think that the current U(C) administration might – in this case – benefit from thinking a little more about pedagogical practice, and less about theoretical posturing. In May of 2016, I taught the last section of my last class as Davidson College’s digital studies postdoc. In this final meeting, students in my “(Histories of) Gender and Technology” class presented projects that ranged from artistic engagements with gender in Kanye West lyrics, to gendered norms in cooking, to quantitative analyses of gendered affect on Twitter. These projects were exciting. They were deeply engaged with historical scholarship on gender and technology, but also carefully used non-traditional forms and methods to make arguments about how we understand that history today. For me (and hopefully, for the students) the class felt like a success. Almost exactly two years before this class meeting, I was waiting anxiously in my office to take a call with Davidson’s Dean of the Faculty formally offering me the college’s new postdoc in digital studies. I’m trained as an Atlantic historian, and while I’d been working with maps, networks and historical statistics for a few years, 2014-me still felt like a covert digital humanist. My own work arrived in the digital humanities via cliometrics, quantitative history and an undergraduate degree from the University of Chicago, the home of “the new social history.” These methods used what today might be called “big data” to get at the lives and experiences of people who left the barest of marks on the historical record. (For example, while we might not know much about one particular voter in nineteenth-century South Carolina, if we look at all voters in aggregate, we might be able to infer something about individuals.) Also, my father is a statistician who encouraged me to think about the quantitative aspects of my research, and I read a lot of Asimov’s Foundation series as a child. In short, I like the intersection of data and history. Despite this trajectory, I think that I began to truly advocate for the digital humanities in the academy when I saw what it could do in the classroom. I saw a marked difference between students’ responses to assignments that were written for me to read but which were then fated only to languish on a hard drive, and assignments that had some kind of public component. The digital turn facilitated that publicness, and with it new kinds of student engagement that (at best) blended quantitative analysis, visualization, mapping and networks with the historical practice I loved to teach. I felt like the “new social history” I’d met as an undergrad was getting a second life. At Davidson, as a visiting assistant professor in the history department, I’d been lucky enough to share that new life with students in historical methods classes. The digital studies postdoc let me continue that work, and explore more, newer, and increasingly weird pedagogies. Over the last two years, I radically re-imagined or developed totally new courses in the digital studies curriculum. I learned to teach humanities labs, used Caleb McDaniels’ “backwards history” methodology, borrowed Tim Burke’s student design class structure and embraced human centered design as a humanities classroom tool. I designed rubrics for digital assessment. I worked with colleagues to develop digital modules for their own classes. I collaborated with the college’s associate archivist to argue for the importance of student-driven pedagogy for digital programs. As a result of all of this, I’ve come to value more flexible classrooms, and come to trust in my own impulses for letting students take control of and ownership in the classes I teach. I’d love to be able to say that the transition from teaching history classes to digital ones was a smooth one, and that my first class at Davidson was an unreserved success. Predictably, however, the first class – DIG360: Digital Maps, Space and Place (we were very proud of that course number) – was quite bumpy. My graduate training had not prepared me to teach technical labs in a humanities discipline or to teach tools as well as theoretical approaches. I also felt (in hindsight, needlessly) that I had to justify the union of the digital and the humanistic (as an aside, I’m now totally convinced by Ryan Cordell’s argument that we should reserve the “what is DH?” readings until the end of the class – if at all). Subsequent classes felt more successful, and by the end of my time at Davidson, I’d settled on some pedagogical interventions that worked well for me. These included letting myself be more flexible with class time and giving students room to play with both tools and intellectual frameworks. I’m also increasingly convinced that asking students to undertake digital projects requires more scaffolding (for now, at least) than traditional academic assignments. We can’t just send them out in the world to do new things, because the anxiety of doing new things wrong has the potential to be more crippling than the structures of essays and exams. As a result of the classes I taught at Davidson, I came to believe that creating an environment in which students feel comfortable tinkering, failing, adjusting and tinkering again is the first and most essential component of digital pedagogy. I also had an insider’s perspective on the development of a digital studies program. One of the realizations I came to in the first class I taught was that if we were going to ask faculty to bring the digital into their classrooms, we would need to offer more support – not necessarily in digital theories – but in how to teach new tools, and in the case of my home discipline of history, how to talk to students about the relationship between theory, historical argument, and making digital things. With that in mind, I think that one of the things I’m proudest of from my time at Davidson is the creation of “digital learning communities” – a structure that the digital studies faculty developed to help the digitally-curious at Davidson explore new tools – on mapping, data and data analysis and student domains. I’m also very pleased that we were able to institute “digital open office hours” – where faculty, students and staff can drop in and talk about their projects, pedagogical victories or challenges, or unpack their own research questions. Having seen the growth of the digital studies program from the inside, the creation of these kinds of communities seems to me like one of the most important pillars of a digital and interdisciplinary program. Digital methods and pedagogies are not, and will never be for everyone. Skepticism towards things digital is not likely to disappear any time soon. There are some very real and substantive critiques about the relationship between the digital turn and the impulse to operationalize the humanities, funding streams, and institutional priorities. But for those scholars and teachers who find digital approaches useful – in some part of their work, or as a central tenet of it – the ability to talk with people who are trying to adapt their teaching and research in similar ways – but often in different fields – is essential. The community that is created through those conversations is central to getting digital programs off the ground and maintaining them as they grow. It has been great to see how a new program, and new methodologies are fostered “from scratch,” and to have the space to develop my own pedagogical approaches. That space – to play, fail, test and re-invent pedagogically – was probably the most valuable part of this postdoc for me. In the process, I hope to have added to the digital curriculum at Davidson, and built some structures that will continue to support that curriculum as it grows. In trying to explain the set of feelings I have about my impending move west, I find myself frequently using the phrase “I am deeply, deeply, natally from New Jersey.” In saying that, I am telling a little bit of a fib (I was born in New York City, but quickly thereafter transported to Montclair, NJ) but the spirit of the claim is true. On my mother’s side of my family, people emigrated to America (usually from Ireland), come to Essex County, and stay there. My great-great-grandfather – Edward M. Waldron – emigrated in the 1880s. He married a woman whose own father (my great-great-great-grandfather – James Moran) had emigrated in the 1840s. Other branches of this particular family tell similar stories. We were from Ireland, and then we were from Essex County. All of this has gotten me thinking recently about the work that maps do for us – in terms of memory, mythmaking, and claimsmaking. I came across this map of Essex County in the 1850s (comprising more space than the county does now) and showing “the names of property holders from actual surveys.” It is difficult to reconcile the suburbia that I grew up in as empty farm lands, but moving through the space of the town now, it is possible to imagine what a hotel at the corner of Bloomfield and Valley might have looked like, or that a chemical works, paper mill and cesspool once occupied the space now taken up by a discount liquor store. With some (very) few exceptions, that past is invisible to us – but imagination can put it back in place. It is not quite the same thing, but I’ve been doing some imaginative geographical work of my own of late. 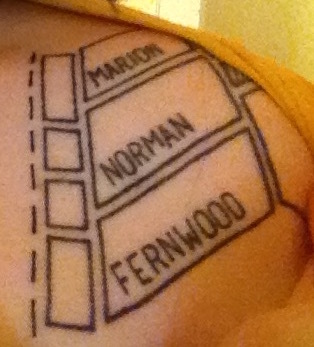 Just over one year ago, I got my first tattoo, which was based on a 1927 street map of Montclair. 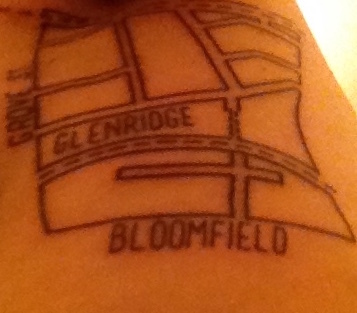 The tattoo is of the area in which I grew up – as I said at the time, leaving New Jersey makes me want to indelibly mark it on my person. A month ago, I added to the map, this time showing the area of town where my partner and I currently live. The two maplets are connected by the railroad – which famously collapses space and time, but which also collapses space on my body. Just as I like the idea of imagining the past haunting the present through old maps, I like the idea that these New Jersey spaces will haunt my body as I travel and age.